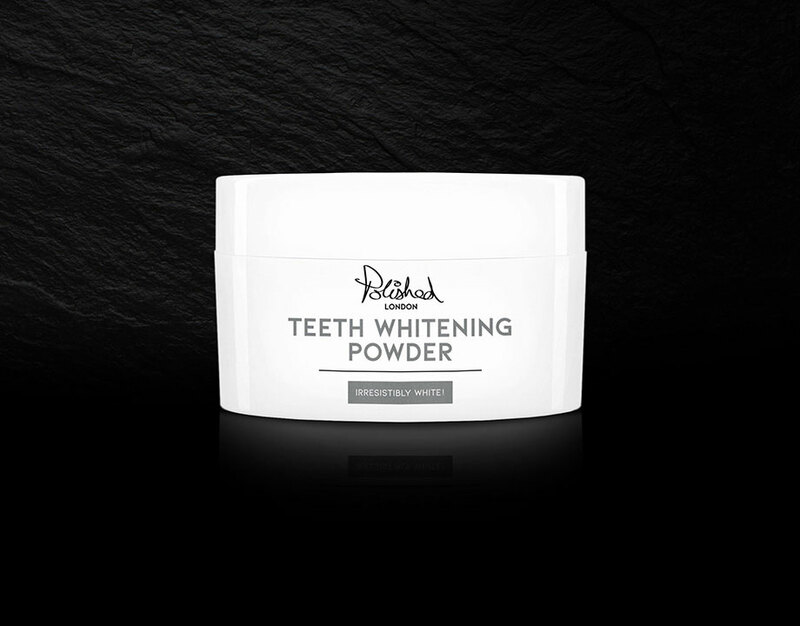 Polished London are flourishing brand that provides a range of safe, vegan friendly, cruelty free teeth whitening products globally through stockists in the UK, Ireland and the US and via their eCommerce website. 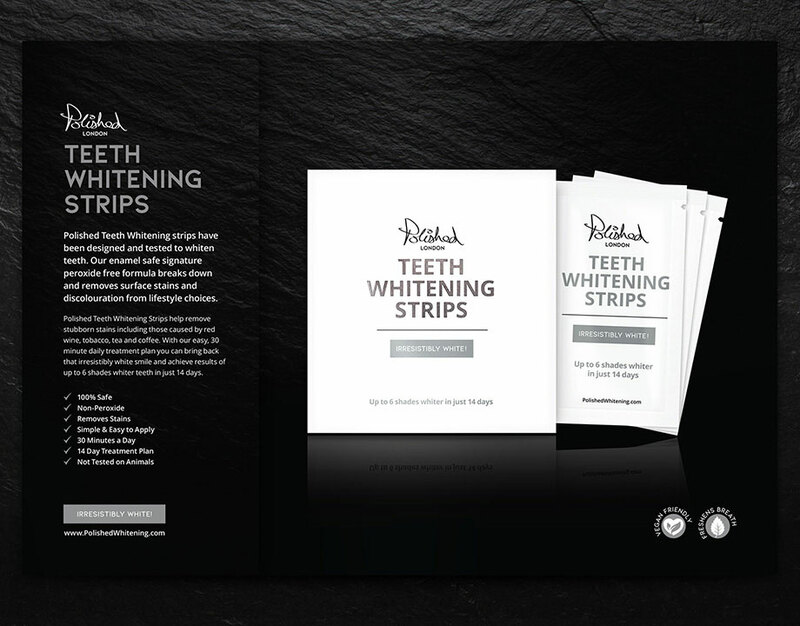 After creating the logo design, original whitening strip packaging and marketing materials, Polished got back in touch with a new requirement: to create package design for their entire product range. This included: whitening strips, two types of mouthwash, whitening powder and an LED/gel based whitening kit. 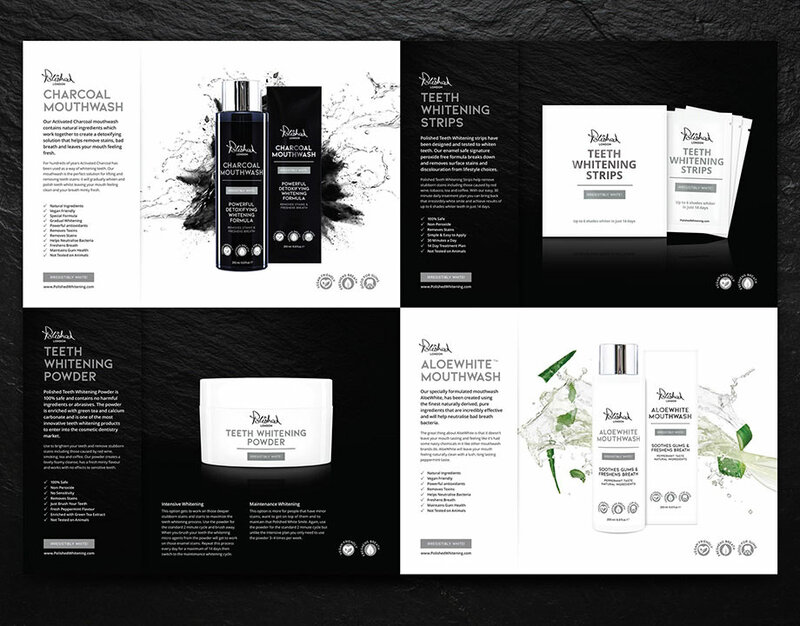 Work also included designing all printed materials along with graphics required for social media channels, the eCommerce website and more. A modern, dynamic and clean design that really pops has been created to capture the hearts and minds of people. I’ve personally developed this brand from scratch so read on if you’d like to discover my insights on the work produced for the project. Creative insight: I discussed market trends and products in depth, working with the client to help formulate a design and positioning strategy that would help the company achieve its objectives. During the research phase I got to grips with the industry. Part of this includes understanding the consumer and what makes them tick, which obviously isn’t only limited to teeth whitening products. A more holistic approach is taken into consideration such as consumer values and lifestyle. This emotional understanding helps to provide direction for the design work so package design that the consumer can associate with their overall self-brand image can be created. When this type of consideration is applied to design and is given the correct support, a consumer-brand relationship has the best chance of developing. 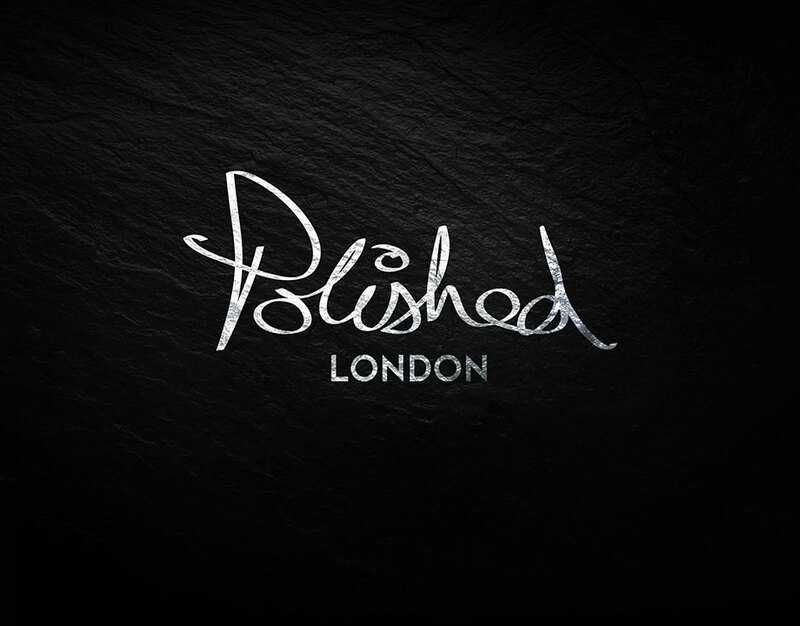 I started work; drafting ideas together to create a universal feel to the package design that would be unique and instantly recognisable across the range as Polished London. After completing the initial design phase, artwork is sent to the packaging manufacturer for prototypes to be produced. This is always and exciting part of any project as the work comes to life. Everything leading up to this point is evident in video footage and samples sent over and a real buzz develops around the project. After this stage tweaks are made, and full production runs are given the go ahead. When the products arrive, they look amazing and I’m tasked with arranging the product photo shoot, including sourcing the photographer and directing the shoot to ensure everything runs smoothly. The client is also on location for evaluation and feedback as we work. 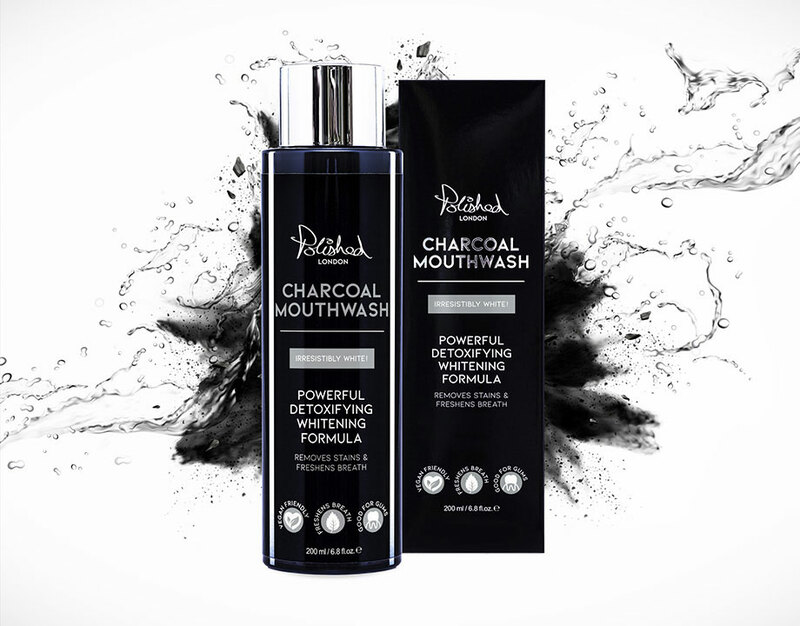 In this particular case, the shoot is quite tricky, as we are faced with shooting predominantly white packaging photographed on a white background which on its own isn’t that hard, however, our products also use mirror effect letting on some of the external packaging to make the products pop. 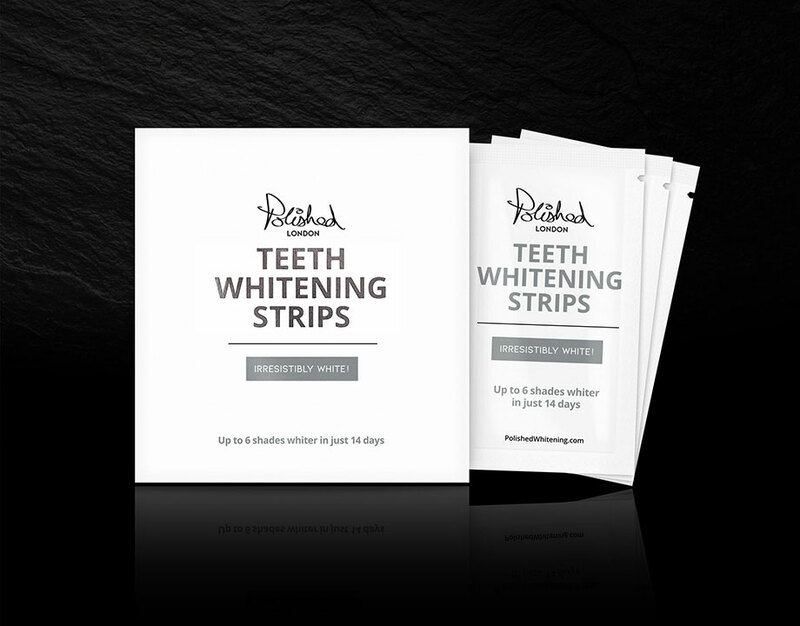 There is also a white pearlescent finish on the whitening strip sachets. This means that we are having to balance light perfectly in order to work with the refractive indexes created by a combination of materials and colours used and studio lighting. Like most photo shoots, the raw images are then corrected to make them perfect. After this work is done additional styling work can be carried out to create dramatic, attention grabbing images. 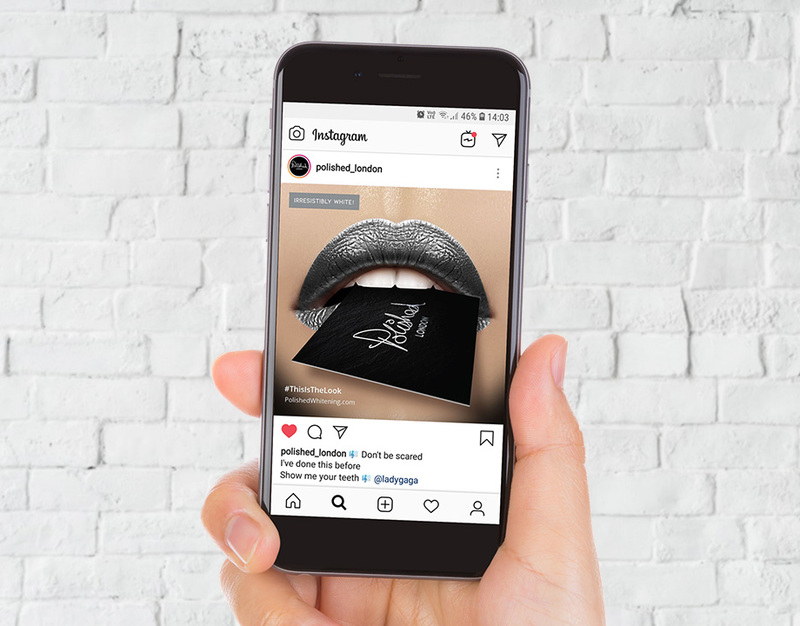 Dynamic images that really pop are especially important for capturing people in digital environments where they are scrolling through images extremely quickly. From here work commenced on the brochure design with both digital and printed versions produced along with the creation and supply of images for social media and the website. “We have worked with Simon for many years now, and it’s always a pleasure. Meeting with Simon will leave you feeling inspired and excited because of his love and passion for his work. 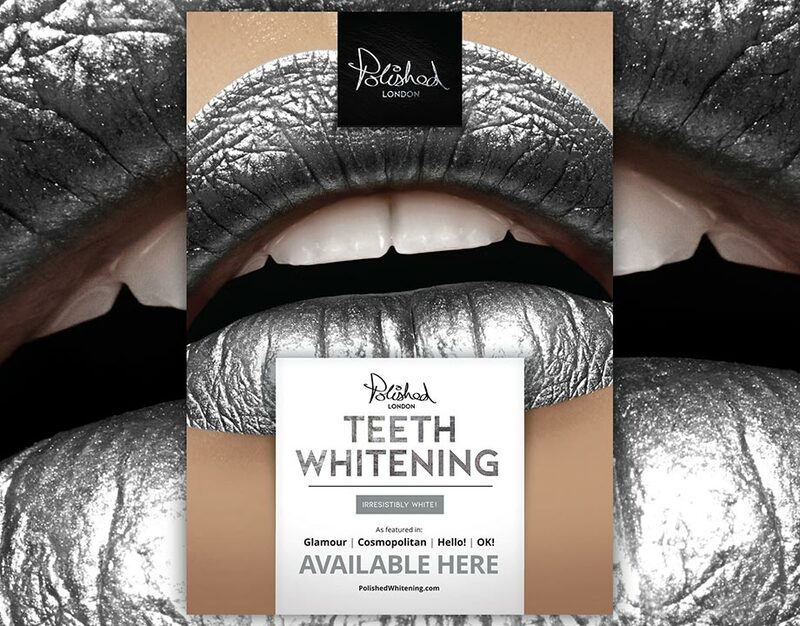 “The work carried out for Polished London’s Teeth Whitening range has had an extremely positive effect on the business helping to dramatically increase brand exposure, recognition and sales. 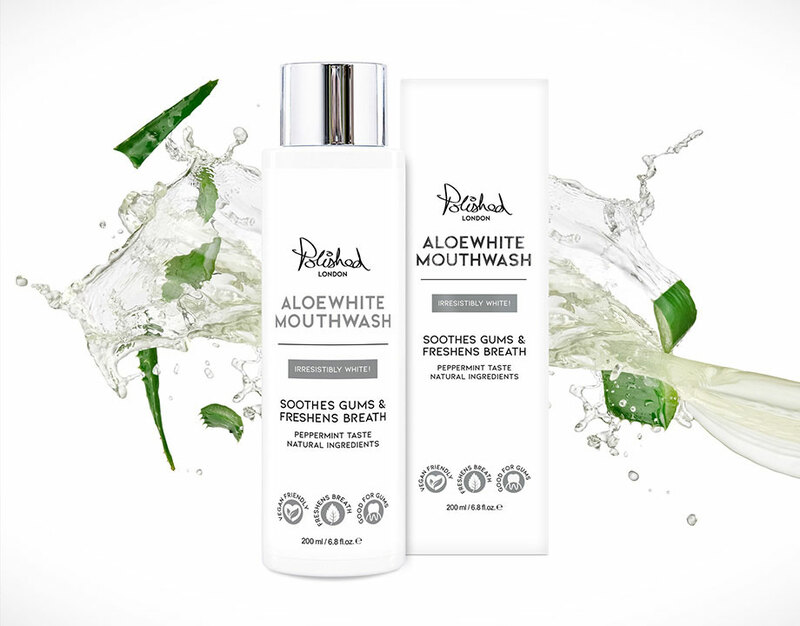 Products have featured on ITV’s This Morning, in articles published in the Daily Mail, high end glossy publications such as Cosmopolitan, Hello!, Glamour magazine and many more. Are you are part of an ambitious small business that wants to reach the next level? Then great branding is a must! Get in touch today to find out more.